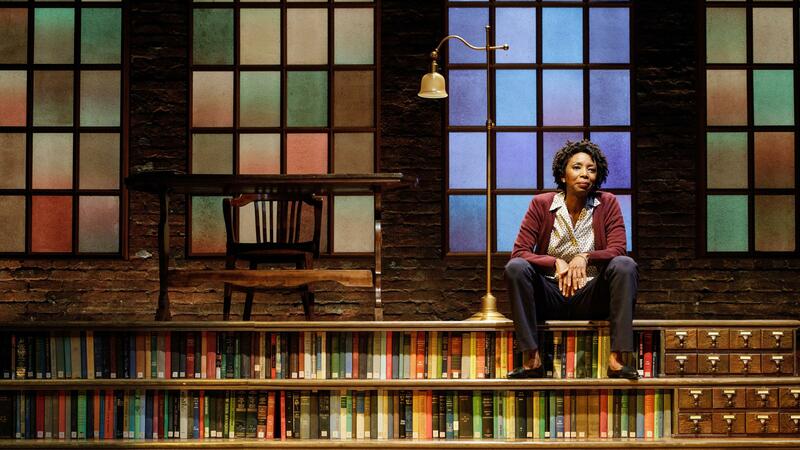 Sharon Washington on stage in her play Feeding the Dragon, about her childhood in a library. Imagine what it would be like to grow up in a library. For much of the 20th century, public libraries built by the philanthropist Andrew Carnegie included apartments for the families of custodians — people like Sharon Washington's dad. Back in the 1960s, she and her family lived above the St. Agnes branch of the New York Public Library, on Manhattan's Upper West Side. On a visit back, Washington descends the marble steps her father once kept spotless, holding on to the wooden bannisters she slid down a half-century ago and glances down at the library's main floor. "My father would sort of be horrified by the floors," she says. "They're scratched and well-trafficked. He wanted them shining. You know, 'I wanna see myself in these floors. Don't step on my floors!'" But she did. When the library was closed at night and on weekends, Washington climbed the five-foot tall shelves and raced her friends on the book carts. She had access to all three floors — and a roof the size of a small playground where her dog Brownie could run free. 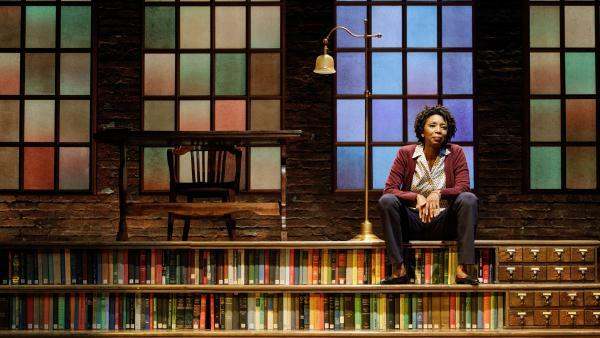 She tells those stories and more in her new play, Feeding the Dragon, being produced by the Primary Stages company at New York City's acclaimed Cherry Lane Theater. "The library roof was an enclosed space that only we had access to. It's where I learned to jump rope, play hopscotch and ride a bike, all under my mother's watchful eye," her character says in the play. "On really hot nights, we'd all sit outside on lawn chairs listening to the radio, sipping sweet tea and looking up at the sky." Washington plays herself, her parents and another dozen characters in Feeding the Dragon. (The play's title refers to her father's daily ritual of shoveling coal into the furnace.) She got the idea for the play after taking a memoir writing workshop with novelist Patty Dann. "I've heard many stories from all sorts of people who grew up in interesting places," Dann says, "but living in a library really is hallowed ground. And so from the outset I knew she had a unique story." Dann helped Washington connect with New York Times columnist Jim Dwyer, who wrote about her in 2009. "The next day his inbox and my inbox were inundated with people who wanted to write my story," Washington remembers. "It was crazy. It was kind of overwhelming. And what I wanted to do is write my own story." She got offers from filmmakers and writers who wanted to collaborate on a children's book. But her story was hardly unique — John Berry's family lived above another Manhattan library. He and his six siblings rode in the library's dumb waiter and played hide and seek and tag. "As we were playing tag, the card catalogue fell over, the drawers broke, cards went everywhere and we knew our life was over on that day!" Berry says, laughing. He lived above that library for 20 years, riding his bicycle and skateboarding through the stacks. "Being in the library after hours is probably the equivalent to Michael Jackson's Neverland," Berry says. "It's like living in a mansion, because you don't make the distinction between, 'I live in an apartment above the library and the library's downstairs.' You don't make that distinction. You live in the complete library. There are just a lot of guests during the day." "Our story isn't told in any of the books that line the shelves of the St. Agnes Library. But in its polished wood is my father's sweat, on the marble stairs my mother's tears, on the wrought iron bannisters my grandmother's prayers," Washington says in the play. But the books did light the path she would take. "I stumbled on to Shakespeare down in the library and I was, like, I didn't really get it," she tells me. "But I thought the stories were kinda cool, and all the fairy tales. I think my father as the custodian and maintainance man couldn't afford to give me a lot but he gave me a library." And he gave her a story that she plans to tell in other media. "Limited HBO series? Why not? Netflix. Hulu. I'm open. And I don't even have to be in it," she says, laughing. Though Washington says she does still plan to turn Feeding the Dragon into a children's book. "So, here I am, the little girl who lived in the library," her character says. "A teller of tales, a holder of history, a king's daughter. I am the story." Imagine what it would be like to grow up living in a library. For much of the 20th century, public libraries built by the philanthropist Andrew Carnegie included apartments for the families of custodians. A new play opening in New York's acclaimed Cherry Lane Theatre tells the story of one such family. Jon Kalish has more. JON KALISH, BYLINE: The St. Agnes branch of the New York Public Library on Manhattan's Upper West Side was home to the Washington family back in the 1960s. KALISH: Sharon Washington descends the marble steps her father once kept spotless, holding onto the wooden banisters she slid down a half century ago, and arrives on the library's main floor. WASHINGTON: My father would sort of be horrified by the floors. WASHINGTON: They're scratched and well-trafficked. He wanted them shining. You know, I want to see myself in these floors. Don't step on my floors. KALISH: But she did. When the library was closed at night and on weekends, Washington climbed the 5-foot-tall shelves and raced her friends on the book carts. She had access to all three floors and a roof the size of a small playground where her dog Brownie could run free. WASHINGTON: (As herself) The library roof was an enclosed space that only we had access to. It's where I learned to jump rope, play hopscotch and ride a bike, all under my mother's watchful eye. KALISH: Washington plays herself, her parents and a dozen more characters in "Feeding The Dragon." The play's title refers to her father's daily ritual of shoveling coal into the furnace. She got the idea for the play after taking a memoir writing workshop with novelist Patty Dann. PATTY DANN: I've heard many stories from all sorts of people who grew up in interesting places. But living in a library really is hallowed ground. And so from the outset I knew she had a unique story. KALISH: Dann helped Washington connect with New York Times columnist Jim Dwyer, who wrote about her in 2009. WASHINGTON: The next day his inbox and my inbox were inundated with people who wanted to write my story. It was crazy. It was kind of overwhelming. And what I wanted to do was write my own story. KALISH: Washington got offers from filmmakers and writers who wanted to collaborate on a children's book. But her story was hardly unique. John Berry's family lived above another Manhattan library. He and his six siblings played hide-and-seek and rode in the library's dumbwaiter. JOHN BERRY: We were playing tag, and the card catalog fell over. The drawers broke. Cards went everywhere. And we knew that our life was over in that day (laughter). KALISH: Berry lived above the library for 20 years, riding his bicycle and skateboarding through the stacks. BERRY: Being in the library after hours is probably equivalent to Michael Jackson's Neverland. It's like living in a mansion because you don't make a distinction between I live in an apartment above the library and the library's downstairs. You don't make that distinction. You live in the complete library. There are just a lot of guests during the day. WASHINGTON: (As herself) Our story isn't told in any of the books that line the shelves of the St. Agnes Library. KALISH: Playwright and actress Sharon Washington onstage. WASHINGTON: (As herself) But in its polished wood is my father's sweat, on the marble stairs my mother's tears, on the wrought iron bannisters my grandmother's prayers. KALISH: But the books did light the path she would take. WASHINGTON: I stumbled onto Shakespeare down in the library. And I was like, I didn't really get it, but I thought the stories were kind of cool and all the fairy tales. I think my father as the custodian and maintenance man couldn't afford to give me a lot. But he gave me a library. KALISH: And he gave her a story that she plans to tell in other media. WASHINGTON: Limited HBO series - why not? Netflix, Hulu - I'm open. And I don't even have to be in it (laughter). KALISH: And Sharon Washington says she still hopes to turn her play "Feeding The Dragon" into a children's book. WASHINGTON: (As herself) So here I am, the little girl who lived in the library, a teller of tales, a holder of history, a king's daughter. I am the story. KALISH: For NPR News, I'm Jon Kalish in New York. Transcript provided by NPR, Copyright NPR.